I have been out of the cycle market for about 10 years. Now that I am looking at getting a nice cycle to enjoy the choices are just mind boggling. Simply from the performance perspective, the numbers just blow my mind. Yamaha R1, around 450 lbs and about 175 rear wheel HP for around $16,000 US. The just announced Kawasaki Ninja 1000 looks to beat that performance with 450 lbs and 200 RWHP at the same price. Both machines have just about every computer assist imaginable to increase performance from traction control to anti-wheelie control to ABS to other stuff that I simply am not grasping. Looking at the numbers says they are around 2.25 lbs per HP, a power to weight ration that just leaves me in disbelief that cycles of that performance level (which seem really streetable) can be bought with a warranty and payments. High 9 to low 10 second quarter mile times with mid 140 mph trap speed and bumping off the 185 mph top speed limiter at about 1/2 mile. There are a couple of choices that even go beyond the two mentioned (ninja R2) but the purchase price starts climbing steeply. Reading up on some of the new offerings makes me wonder what I would ever do with the level of performance they offer besides kill myself but it is outstanding to think how far cycles have progressed since the days of carburetors and leaded fuel. It makes me feel blessed to live in such a great place and time. Still haven't decided between an FZ-07 and an FZ-09. I'm in the same boat as you...I'm looking at the fz-09 over any crotch rocket... The fz-09 to me screams "multi purpose" sleeper...I have the fz-07 and everyone from newish to professional lvl riders who have rode my bike have nothing bad to say a out the fz-07 except for holy shyt!!! I have no idea what I would do with 200 hp. The FZ-07 has more power than I am using. I am thinking of test riding an FZ-09 some time just out of curiosity, but I have no intention of replacing the -07 any time soon. FYI when I was testing new bikes, I tried the FZ-07, FZ-09, and FJ-09 among several other Triumphs and Ducatis. IMHO the FZ-07 is better than the FZ-09. Sure, the 09 has a bigger engine and better performance, but FZ-07 is way more "usable". At least for me, the FZ-09 has the same problem on the streets that a lot of new sportbikes and my previous CBR 600 had - too much power. You end up not using the full range of your gears and it makes the ride boring unless you are going 60+mph constantly which is just not viable. My CBR would do 0-62mph in first gear, and up to ~90mph in 2nd gear. This means that sitting on the highway at 65mph felt like I was cruising through a neighborhood at 30mph with my car. It was a recipe for trouble (RIP my driving record). With the FZ, most riding is more challenging (and ultimately) more fun because I can't just abuse a ridiculous amount of power to go fast. The new supersports/superbikes the OP is referring to are designed as "track first, commuter second". The only way I would get one of them or an FZ-09 over an FZ-07 is if I was out in the country with a LOT more road. But here in Western WA it is a bit overkill. Ah, the big power is intoxicating and beckons to us all at one time or another. If you're anything like me you are going to feel compelled to ride that FZ-09 fast all the time with that peppy, racy engine sound. Riding that bike slow would be like trying to drive a Ferrari slow all the time, it's probably not going to happen and may get you into trouble. The FZ-07 is a little more mild mannered sounding which doesn't make you want to go fast all the time. It's more a sleeper, a gentleman's bike I would say. Of course if you do feel like a little shot of adrenaline to get the heart pounding, going fast or pulling a wheelie in 1st or 2nd it will do it, just like an FZ-09 can. Bottom line, if you're done moving up in size on bikes, been through all that and want to settle down to something that's good all around and makes good sense the FZ-07 is a great bike for that. It's what most pro reviews have said when raving about the 07. I have been out of the cycle market for about 10 years. Now that I am looking at getting a nice cycle to enjoy the choices are just mind boggling. My main reason to go for the FZ-07 was weight and comfort of the seating position (I replaced the stock seat after a few months). The bike is light and feels very nimble and you can do pretty much anything with it. It just felt better than the FZ-09 in my opinion. On the performance side, after replacing the exhaust, adding an EJK and a new airfilter, the bike's acceleration and smoothness on the throttle is fantastic. I still believe for the the money, there is no better bike out there than the FZ-07. Today I probably would also check out the FJ model. Ultimately, the FZ-07 was the best buying decision I made in a loooooong time 8-). I've come to the realization that I just need 3 motorcycles in my stable, all different engine sizes. I have 2 so far, one more to go! 1000cc 4 cylinder, you're next! Insurance and garage space dictates I can only have a max of 3. Actually right now 2 would seem like the limit, but I'm sure I can push it to 3. My limit is 6. I have had 8 at one time because of deals found before selling. I have toured 46 states so far, and still ride dirt and vintage trials. In my garage I have a touring bike, sport touring bike, lightweight naked bike, Cafe bike, Dual Sport bike, and Vintage Trials bike. Although I can technically park a dozen motorcycles in my garage including 2 cars, it is also our home gym plus storage, so I can't fit more than 3. But really, its the insurance that is killing me already. I would love to own more than 3. Insurance can be unbearable based on where you live, your credit rating, years of riding experience, and type of bikes you choose. I am up to $600 a year to cover the 5 street going bikes. Plus $550 a year to register them all. That is what a lot of people spend on TV and/or Internet and/or cell phones. I'm the same boat as a few others. 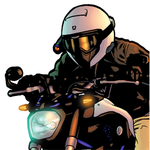 I just came off a '14 Ninja 1000 and found that while it was awesome to get up to speed, it literally only took a few seconds to do it, then I had to watch out for the police while grabbing the brakes to get back down to sub GoToJailImmediately velocity. The FZ-09 isn't really that far behind. If I got one of those, sure, I could keep it in B mode for a little relief, but the devil on my shoulder wouldn't like that for too long.